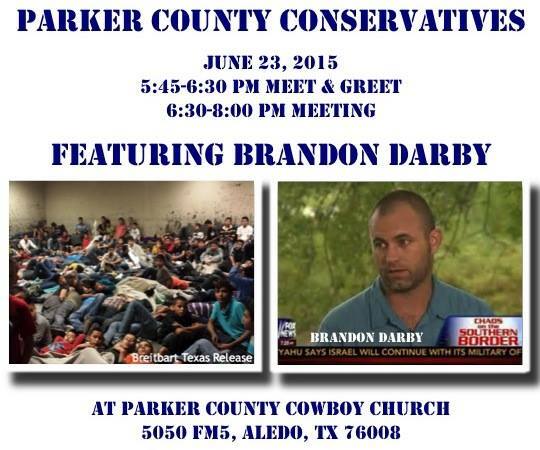 Join us on the evening of June 23 to hear Brandon Darby, the man who broke the story last June about the thousands of illegal immigrant children pouring across our southern border into Texas. Brandon has practically lived at the Texas/Mexican border the past two years where he has developed a good relationship with the Border Patrol. Currently the Managing Director for Breitbart Texas, Brandon has broken numerous stories about what is happening at the border that the mainstream media has refused to cover. Though once a prominent radical who worked with former Black Panther Party members, Palestinian and various other radical groups, his experiences led him to have a deep love for his country and to feel an obligation to support and protect its system. He gained international recognition for his role as an undercover operative in the FBI’s Informant/Human Source Program, working with the FBI’s Joint Terrorism Task Force and having directly participated in stopping violence against U.S. and Israeli citizens. Furthermore, his public stance of being proud to have served with the FBI and his refusal to be silent and enter the Witness Protection Program has been a source of controversy and outrage amongst radical Leftist groups. His work and efforts have been profiled in hundreds of print, radio, and television interviews. He has been a subject of numerous documentaries. Recently, the local chapter of the National Border Patrol Council honored Breitbart Texas and Brandon for their work in exposing the realities of law enforcement along America’s southern border. Brandon also won the Best Sunlight Post of 2014 at the annual CPAC Blogbash ceremony, for his work highlighting the overcrowded conditions of U.S. processing centers for illegals detained at the border. Hope to see you on June 23 for an evening with like-minded conservatives as we hear the truth about what is happening on our Southern border. You don’t want to miss this opportunity! I trust some conversation of ” ObamaTrade “, which your 2 traitorous Texas ( and most RepubliCon _ ) Senators SUPPORT, is injected. And the pathetic K Granger was a desperate cheerleader for this blatant lie of “free trade”. Your pathetic pair of waana-be Tea Potty traitors will vote on this tomorrow.